Many know that St. Valentine’s Day had pagan origins. But today it’s just a day of romance and fun, right? Does its past really matter to God? Why would it matter that the origin of Valentine’s Day is rooted in paganism? In this day and age, who really cares? After all, you’re just interested in doing something nice for your significant other on a day that seems to be for that purpose. So what’s wrong with that? So what if the origin of this holiday goes back into ancient history? Would it matter if it turns out that what we consider innocent fun is actually offensive to God? First, let’s take a brief look back into the ancient history of Valentine’s Day. The ancient Roman festival Lupercalia is considered to be one precursor to Valentine’s Day. It was celebrated from Feb. 13-15 as a purification and fertility ceremony. “They would then strip the goat’s hide into strips, dip them into the sacrificial blood and take to the streets, gently slapping both women and crop fields with the goat hide. Far from being fearful, Roman women welcomed the touch of the hides because it was believed to make them more fertile in the coming year. “The Roman romantics ‘were drunk. They were naked,’ says Noel Lenski, a historian at the University of Colorado at Boulder. Young women would actually line up for the men to hit them, Lenski says. They believed this would make them fertile” (History.com). The Roman church was astute enough to keep the game of chance alive due to its popularity. But it replaced the women’s names with names of saints. Both men and women participated in the drawing and were told for the following year to emulate the life of the saint whose name they had drawn. But the pagan roots are still visible today. 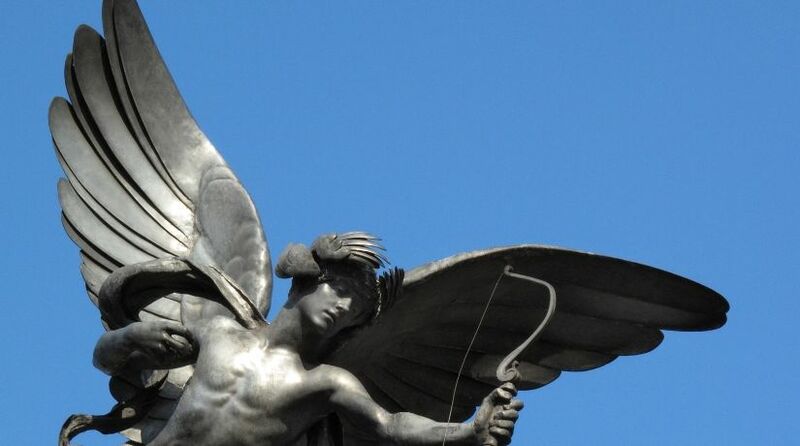 “A common symbol of Valentine’s Day is Cupid (‘desire’), the Roman god of love. The son of Venus and Mars, he was originally depicted as a young man who would sharpen his arrows on a grindstone whetted with blood from an infant, though now he is commonly presented as a pudgy baby. This transformation occurred during the Victorian era when business owners wanted to promote Valentine’s Day as more suitable for women and children” (RandomHistory.com). In our time there’s little acknowledgment of any of the sordid history, and the emphasis is on romance and relationships. So back to the question we started with: What difference does it make? God has given some very serious warnings in the Bible about deciding for ourselves what is right and wrong and about how He wants to be worshipped. If we care about the Word of God, we should consider how to apply those principles to the observance of Valentine’s Day. Most people consider their participation in Valentine’s Day to be harmless fun. But how we view the day might change if we care what God thinks about holidays and festivals that have their origin in ancient pagan cultures, as Valentine’s Day clearly does. God has given some very serious warnings in the Bible about deciding for ourselves what is right and wrong and about how He wants to be worshipped. If we care about the Word of God, we should consider how to apply those principles to the observance of Valentine’s Day. “Then it shall be, if you by any means forget the LORD your God, and follow other gods, and serve them, and worship them, I testify against you this day that you shall surely perish” (Deuteronomy 8:19). “Take heed to yourself that you are not ensnared to follow them, after they are destroyed from before you, and that you do not inquire after their gods, saying, ‘How did these nations serve their gods? I also will do likewise.’ You shall not worship the LORD your God in that way; for every abomination to the LORD which He hates they have done to their gods. … Whatever I command you, be careful to observe it; you shall not add to it nor take away from it” (Deuteronomy 12:30-32). God has given us many examples to show us that He hates pagan practices and celebrations, but mankind continues to ignore the warnings. We may conclude that Valentine’s Day is harmless and say that we don’t practice the original pagan traditions. But God does not take these things lightly. Our world is filled with customs, like Valentine’s Day, that reflect problematic origins. It does make a difference to God. How about you?